For over thirty years I have been researching how the quality of a space can have developmental benefits, stimulating young children on many different levels and playing a crucial role in their social, cognitive and physical development. This work has included visits to thousands of education buildings all over the world, observing and documenting the activities which take place there. Over those years my explorations were translated into designs for many purpose-built schools and nurseries reflecting this deep empathy. The evidence of this engagement shows a number of positive effects of a well-designed school. Specifically, the links between space, pedagogy and outcomes. Citing clear evidence that an architecturally enhanced school building improves academic performance and helps to sustain it throughout the life of the child. Crucially, they represent the proposition that architecture can be inspiring, both for young children and for those who teach and care for them. This helps them build strong relationships. In this way they highlight the importance of young children within and to societies. My research journey and my career as an architect to date have been devoted in no small part to these issues as they affect primary schools and the children who use them. Its original impetus came, through my profound interest, as a Father and as an architect, in an area of architecture no less important, but much less researched, buildings for young children. As my children progressed through the UK education system, this expertise has broadened to take in secondary schools and higher education environments. However, to make this work as proscriptive as possible, this PhD study will be contained within the framework of learning environments for children aged 0-11 years. Mere observations are not knowledge. In order to make the world comprehensible, the need to connect observations into comprehensive theories, is a critical task. Learning from the ideas of generations of educationalists as well as from the pioneers of kindergarten and primary school architecture in countries as far apart as Japan, Germany, Malaysia, Mexico, Italy, Tajikistan and Wales, I have developed a conceptual and practical framework defining the soft and hard features of school environments that optimise learning and development. This framework has been shared and continually expanded not only in a range of academic and theoretical publications, but also in practical guides to planning, designing and building imaginative and exciting spaces for young children. The latter are aimed at primary school teachers and head teachers, early childhood practitioners, those commissioning buildings for young children and fellow architects. There are 21,200 schools in England. Their estimated internal area is 62 million square metres. Approximately 60 per cent of school space in the UK was built before 1976. There is a need to increase the number of school places by 5 per cent in the next five years. Much school space will need to be adapted and re-imagined to meet changing needs. The involvement of commercial interests in the provision of education and learning is increasing and requires a more informed set of ethical principles. Clarifying the links between architectural space, pedagogy and outcomes is now critical. The need to provide a new guiding story is the context within which this PhD by Publication is being formulated. The discipline within which I am working, specifically environments for learning, and the design of school buildings, is primarily about the convergence between architectural theory and education. However the field is also touched by other sciences each of which has something to say about this area of knowledge. This includes psychology, anthropology, human geography, neuroscience and evolutionary biology. First and foremost is the discipline of architecture. As this is a broad area, and some would argue more akin to an art than an exact science, it tends not to differentiate its expertise, rather it engages evenly across all building types. The tendency is to search for an operational framework within which general precedents and broadly understood human needs are applied directly to schools. Then the architect is left to ‘get on with it’. So for example, an architect may say, this is a door for a new office building, so let’s use the same for our new school project. But for a young child, a door has a number of different roles to play, from security and access, to phenomenological and symbolic meanings. Each end of this spectrum has the potential to communicate knowledge, inspire and excite. This then is the story I wish to tell, that the educational environment is first and foremost, child-centric. School buildings are an increasingly specialist area which necessitates significant innovation and knowledge compared to other building types. Whilst there are some examples of state of the art design for education, these are few and far between, especially in the case of re-furbished school buildings. Some argue that schools architecture is conservative and lacking in innovation; crucial questions are not asked and therefore not resolved, since we can’t agree on what the crucial questions are. Increasingly government simply asks, where is the value? In the vacuum of our response, they are wont to conclude that cheap is best. The aim here is to clarify and make more transparent how investment can be translated into improved outcomes. This critique can be seen in its clearest focus during the process. School design is most often delivered by a somewhat limited functionalist matrix referred to as ‘the brief’. This will incorporate room schedules and circulation spaces which are described in purely technical terms as ‘classrooms or corridors’ or as ‘spaces for learning and spaces for circulation’. It is educationalists, often teachers and school pupils in consultation, who will be expected to explain the more nuanced aspects of the environment for a new or refurbished school building. They will be expected to identify both the hard and soft elements of the menu, the points of play and poetry, which my experience shows, will prove to be important for the effectiveness of school environments in use. However the consutees will almost certainly lack the knowledge, the language and the time to determine what is important. Crucially they may totally fail to anticipate and provide for future changes during the lifespan of the school building. In the commentary to my PhD by publication I intend to retrace the steps of this 30 year research and practice journey and illustrate the development of my conceptual framework with reference to a set of eight key publications produced during the last twenty years. This will include other key reference sources which have contributed to this body of knowledge. I also intend to provide an in-depth analysis and a visual drawn menu of the precise nature of environmental features which enable learning and encourage social development. These will be distilled down into a ‘tool kit’ style document which will be made available to key stakeholders such as teachers, heads and school governors in the process of developing existing school buildings. An accompanying explanation of their relationship to particular aspects of learning, in all its forms, as well as a synthesis of their combined effects will complete the study. The Third Teacher: How Children Learn, Dudek, M., Routledge, to be published June 2018. For previous generations of children, the world seemed to be more open and available for exploration than today. Now, parents and grand-parents often hark back to a time when as children themselves, could disappear from adult control, and lose themselves in the urban, sub-urban and rural environments surrounding the home. Today these environments are no longer freely available, instead children are controlled and corralled, seemingly having lost this sense of freedom. Or have they? The Third Teacher is an analysis of the contemporary spaces and events outside of school, where children and their parents learn about themselves and the wider world in which they live. Schools and Kindergartens – A Design Manual, Dudek, M., Birkhauser, Second and Revised Ed. 2015. ISBN 0 7506 3585 1. Comprehensive, international edition, 260 pages, 300 illustrations, in four languages. Includes sections on spatial configurations, acoustic design, lighting design, sustainability, outdoor spaces, and an educationalist’s perspective on nursery design, educational systems, historical paradigms plus seventy case studies, visited, reviewed and assessed by the author. Spaces for Young Children, Dudek, M., National Children’s Bureau, Second Ed, 2011. 978 1 907969 95 9. Aims to ensure that advances in children’s architecture will be well informed. It has been revised throughout and includes an overview of legal compliance, consulting with children, building for communities, local involvement and achieving high quality builds with small budgets, etc. Kindergarten Design, Dudek, M., Chinese Detail – Cancha Multiple, 2012, ISBN 978 7 5611 6847 9. Comprises 32 case studies, international in scope, includes projects by Mark Dudek Associates. Illustrates ‘state of the art’ in conceptual strategies, materiality, colour and space standards, sustainability and architectural design for children, all in fine detail. 183 pages over 600 illustrations. Nurseries – A Design Guide, Dudek, M., Routledge, 2013, ISBN: 978-0-7506-6951-1. A practical review, 176 pages, 120 illustrations, includes chapters on Environmental Psychology: how to evaluate quality within the learning environment, the sustainable nursery: a good environment is a natural environment, the natural child: under the crab apple tree… , a historical overview: form becomes feeling, a nursery brief: design for learning, with many projects featured by Mark Dudek Associates. Architecture of Schools – The New Learning Environments, Dudek, M., Architectural Press, 2006, ISBN 0 7506 3585 1. A landmark publication on schools architecture in the UK which anticipated the re-construction of Britain’s schools over the following decade. 240 pages, 300 illustrations, includes sections on early years architecture, origins and significant historical developments, the educational curriculum and its implications, making the case for architecture in schools, the community school plus 20 international case studies, including comparative space and area standards. Kindergarten Architecture – Space for the Imagination, Dudek, M., SPON, 2000, 2nd Ed, 2008, ISBN 0 419 19670 6. In depth assessment of the early years systems which defined the subsequent Surestart program of children’s centres between 2002-2012. 300 pages, over 250 illustrations, widely recognised by policy makers as the most influential publication of its time. Case studies include projects from Reggio Emilia, Denmark, Sweden, France, Germany, Mexico, the USA all of which were visited during the course of research. Research Questions (applied to a number of existing case study examples). The following list should be considered within the context of ‘the desired outcomes’. In other words the links between space, pedagogy and outcomes. What elements of the school’s existing structure are falling short? What elements of the school’s existing structure are valued and cherished by the existing school community? How does the school support the wider community and how can this be developed towards the use of the school site as an all-the-year-round institution? Identify the impediments to learning and social progress, what evidence supports the need for change and how can these changes be implemented? How can we test the value of good school design in socio-economic terms? The story of car design is one of constant evolution. The market requires this. Whilst most cars have four wheels and a steering wheel, just as they had 20 years ago, in practice the difference between an Austin Allegro from 1970 and a modern Toyota Prius, is startling. Seeing one model standing next to the other, emphasises the extraordinary change that 50 years of development and investment has brought. Today the Austin would be viewed with some cynicism, as a slightly dumb anachronism compared with its contemporary. How did it come to this? The changes are incrementally wrought, as each manufacturer invests to keep up with the trends. Traffic may move at the same speed as it did back in the 1970s, but that’s not really the point. As consumers we demand progress in our automotive products, this in turn feeds an industry which sees change matched to technology matched to the subtleties of making each vehicle desirable in its own special way. This is primarily about marketing, it carries with it the power of modernity. In the future we can anticipate driverless cars, where the steering wheel may completely disappear. Environmental concerns will soon see the replacement of the internal combustion engine with electrically driven motors. Efficiency and economy go hand in hand with desirability and inspiring design. Many see this as a normal human progress that enriches life and promotes social well-being. It is inspirational. Compare this to the evolution of school buildings. I’m guessing here, but most adults who return to their primary school, whilst viewing the buildings with fond sentimentality, for example that’s where I learned how to do a cart wheel, and that’s where Mrs Walsh tested me on my seven times tables, will see a world that has changed very little over the 20-30 years since they were in attendance. We don’t have an economic system to improve school buildings through continuous evolutionary change. Neither do we have a truly competitive construction industry where excellence in the design of its school buildings commissions ensures profitability and repeat business. However we can now look back at a number of school buildings produced 20—30 years ago, and if our observations are critical and analytical, we can begin the process of understanding a more progressive way to adapt and maintain existing primary school buildings over time. To complete the analogy, we need to ask, how does the school market itself? Therefore the theoretical resources to be drawn on will be comparative analysis of a number of old school buildings, set against the modern equivalents. The study will be applied specifically to 12 case study examples which the author has been involved with either through previous research or through his own design studio, over the past 20 years. These will act as known exemplars so that the specific elements of each are readily understood and can be readily tested. We understand the initial aim, now we need to understand what the outcomes have been. The research methods appropriate to this will be a combination of observation, interview and questionaire. Former pupils, teachers and parents will be interviewed, to understand how their children faired, whilst in attendance. We will also engage with current users, by way of accompanied walk-throughs, collating statistical analysis, what size is it, how big is it and what is it made of, with more instinctive reactions (as you might expect in a car showroom), as to its desirability, comfort and emotional connectivity. Finally we will collate outcomes from a further sample of ten schools, five of which are new and considered ‘state of the art’ and another five similar buildings of much older vintage, which are considered mediocre or poorly designed. Such a synthesis should provide the foundation for the development of an evidence based method for the assessment of children’s environments in the early years and at primary level and address the ‘general questions’ cited above. In this way I will test the initial thesis, that an inspiring architecture is essential to the development of young children’s social, cognitive and physical development. This then will be formulated into a major research proposal, for submission to the Leverhulme Trust, so that the thesis can be tested more rigorously. I make the assumption that the start date for this research will be end of September 2017 and the duration will be 12 months. Play in Early Childhood – from birth to six years, Sheridan, Mary, D., Routledge, 1966. Metaproject for an environment for Young People’s Reflections on an Education for the 21st Century. 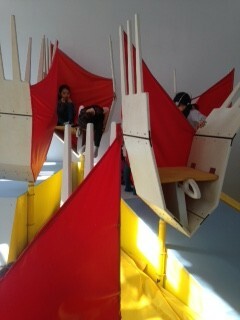 Ceppi, G., and Zini, M. (eds), 1998, Milan: Reggio Children/Domus Academy. Affordances of Children’s Environments: a functional approach to environmental description, Children’s Environments Quarterly, vol 5, no. 3. School, Burke, C., Grosvenor, I., Reaktion, 2008. Children and Young People’s Spaces, Developing Practice, Foley, P., Leverett, S., (eds), The Open University, 2011.